Building a strong faculty team is key to JI’s talent training mission. JI recruits faculty from all over the world. Currently JI has 57 faculty members, who have either graduated from or worked in world-class universities such as Harvard, MIT, Stanford, Oxford, UC Berkeley, Cal Tech, UM, or Princeton. More than half of all JI faculty are foreigners. Many are winners of prestigious awards such as Chang Jiang Scholar, Thousand Talents Program, New Century Talents, Pujiang Scholars, and Shanghai Magnolia Gold and Silver Awards. Our unique academic environment allows faculty, visiting scholars, and students to keep up with the frontiers of technology. JI’s research projects are funded by Chinese national and municipal governments, local industries, and foreign entities. Our research fields and areas of collaboration grow broader and deepen evermore. Total students： 1483, including 1284 undergraduates, 199 graduate students. JI Students are among China’s best. The quality of students is very high. JI’s reputation as a premium institute is steadily improving. The average GPA for JI students who enrolled in the UM-SJTU Dual degree program is 3.8, far exceeding the average of 3.2 for UM’s School of Engineering. Nearly 90% of JI’s graduates went to the graduate schools worldwide. Classes of 2010-2018 enrollment (statistics) for top graduate schools in the U.S. 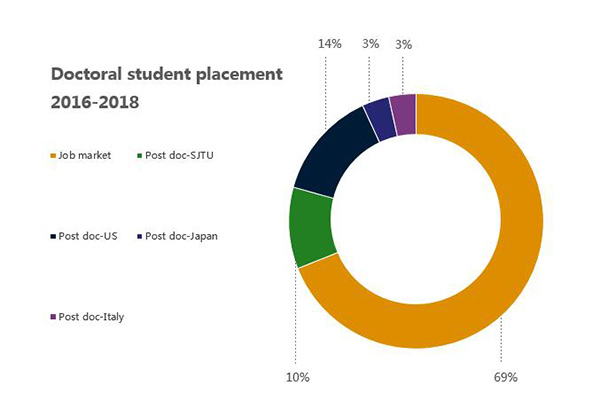 Among the 2010-2018 JI graduates, more than 80% continue to study at graduate schools among which 90% are top graduate schools of the world and 95% are in the U.S. The first class of JI graduate students has graduated in 2013. Among the graduates, 30% continue further graduate study in world-class universities, and 70% are employed by Chinese top 500 companies such as Shanghai Volkswagen, General Electric, and Shanghai Electric, Shanghai Research Institute, and famous universities.